Planning my Austrian GP trip! Every year since 2014, my dad & I have attended the USGP in Austin (it helps that its only 3 hours away). However, every time we watch the Austrian GP, he tells me how that would be his #1 track to visit because, well, look at it. So this year I decided to pull the trigger and surprise him with tickets to the Austrian GP in July! As of right now we’re planning on staying a week starting in Stuttgart, where we’ll visit the Mercedes & Porsche museums, then down to Munich and then to Spielberg. 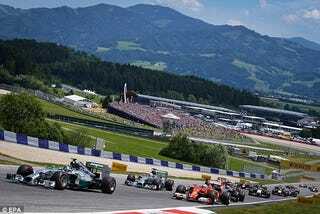 Does anyone here who’s attended, have any travel tips/places to check out for the Austrian GP, or Germany in general?